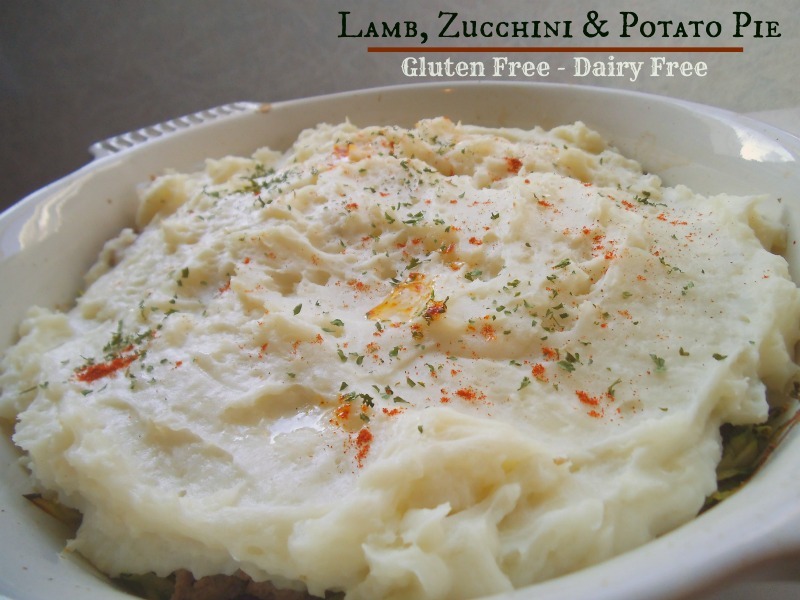 My family absolutely loves this hearty casserole, which is why I am willing to make the mashed potatoes from scratch. But if you happen to have leftover mashed potatoes, you’ve got yourself one of the easiest, most satisfying suppers ever! Lamb is not a meat I grew up eating much, but I love it now. Not everyone feels the same way about lamb, but after tasting this casserole, I think almost anyone could become a convert. If I cannot find good ground lamb, though, ground beef or meatballs are fine options as well. This is truly a versatile dish. Even the zucchini can be traded out for cooked green beans. So if you happen to have leftovers that include a heap of mashed potatoes, green beans, or both, this casserole practically makes itself! Preheat oven to 400 degrees F (200 C). Place grated zucchini in a 2 quart baking dish and add oil, mixing to combine. Add sea salt to taste. Bake zucchini for 15 minutes to remove excess moisture. Place potato pieces in a large pot and add just enough water to cover them. Bring to a boil and cook over medium heat until soft, testing with a fork. Drain off some of the water if necessary, reserving some liquid for moisture (instead of adding milk). Add butter or margarine and mash with a potato masher or blend with an electric mixer. Blend in mayonnaise until potatoes are smooth. Season with plenty of salt to taste. Brown ground meat in a small amount of oil. Season with salt and stir in garlic. Cook meat until red disappears. Remove hot baking dish with zucchini from the oven. Add cooked meat, followed by mashed potatoes, spreading the potatoes to cover the meat. Bake the assembled pie for 20 minutes or until top of mashed potatoes are golden. Remove the pie from the oven and let it cool for a few minutes. Before serving, dot the top of the pie with butter or margarine and sprinkle with parsley and paprika. I share recipes at Allergy Free Wednesdays, Gluten Free Wednesdays, and here. I have a niece that is in love with zucchini like this and gild it with mashed potatoes will send her over the moon. Not sure about the lamb part. It may be that I don’t know how to cook it properly. I have found it gamey. Am I doing something wrong? I’ll eat almost anything with enough garlic. 🙂 Lamb does have a distinctive flavour though, so if you’re not sure, I’d use ground beef or meatballs. Maybe try ordering lamb at a Middle Eastern restaurant some time and see if you like it. Thanks for linking up at Pintastic Pinteresting party. I love lamb. I will have to try this. This sounds very comfy and warm, perfect for Spring weather and St. Patrick’s day! I’ve never made mashed potatoes with mayo before. Very interesting! I started using mayo in potatoes when I had to avoid dairy. I still use it sometimes, but milk or sour cream could also be subbed. Thanks for your kind words and for inviting me back!